European style quality from Hansa. Toys that teach. Hand made in small lots. Kiwi - any of three species of flightless birds belonging to the genus Apteryx and found in New Zealand. The name is a Maori word referring to the shrill call of the male. 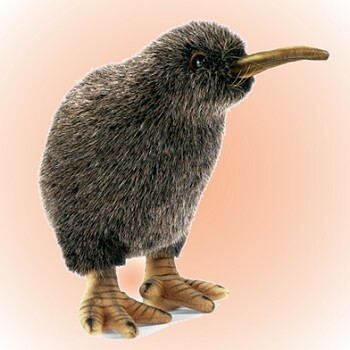 Kiwis are grayish brown birds the size of a chicken. Dwelling in forests, kiwis sleep by day in burrows and forage for food—worms, insects and their larvae, and berries—by night. They can run swiftly when required; when trapped they use their claws in defense. One or two large white eggs—up to 450 g (1 pound) in weight—are laid in a burrow and are incubated by the male for about 80 days. The egg is, relative to the size of the bird, the largest of any living species. The chick hatches fully feathered and with its eyes open; it does not eat for about a week. Although no longer abundant, kiwis appear to be in no danger of extinction and may even be gradually adapting to semipastoral land.